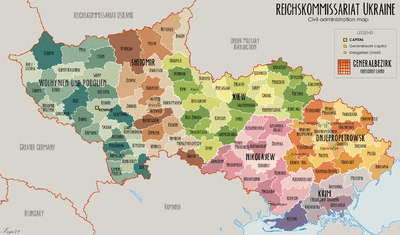 During World War II, Reichskommissariat Ukraine (abbreviated as RKU), was the civilian occupation regime of much of German-occupied Ukraine (which included adjacent areas of modern Belarus and pre-war Poland). Between September 1941 and March 1944, the Reichskommissariat was administered by Reichskommissar Erich Koch. The administration's tasks included the pacification of the region and the exploitation, for German benefit, of its resources and people. 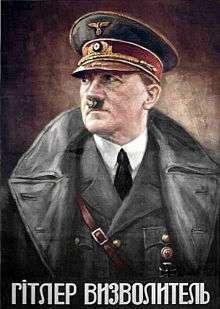 Adolf Hitler issued a Führer Decree defining the administration of the newly occupied Eastern territories on 17 July 1941. Before the German invasion, Ukraine was a constituent republic of the USSR, inhabited by Ukrainians with Russian, Polish, Jewish, Belarusian, German, Romani and Crimean Tatar minorities. It was a key subject of Nazi planning for the post-war expansion of the German state and civilization. Nazi Germany launched Operation Barbarossa against the Soviet Union on June 22, 1941 in breach of the mutual Treaty of Nonaggression. The German invasion resulted in the collapse of the western elements of the Soviet Red Army in the former territories of Poland annexed by the Soviet Union. On July 16, 1941, Hitler appointed the Nazi Gauleiter Erich Koch as the Reichskommissar for the planned Reichskommissariat Ukraine, which was created by the Führer's decree on August 20, 1941. Originally subject to Alfred Rosenberg's Reich Ministry for the Occupied Eastern Territories, it became a separate German civil entity. The first transfer of Soviet Ukrainian territory from military to civil administration took place on September 1, 1941. There were further transfers on October 20 and November 1, 1941, and a final transfer on September 1, 1942, which brought the boundaries of the province to beyond the Dnieper river. We are a master race, which must remember that the lowliest German worker is racially and biologically a thousand times more valuable than the population here. — Erich Koch, March 5th 1943. On 14 December 1941, Rosenberg discussed with Hitler various administrative issues regarding the Reichskommissariat Ukraine. These included a dispute over Koch's status and access to Hitler, manpower shortages over gathering the harvest, Hitler's insistence that the Crimea and much of Southern Ukraine was to be "cleaned out" (i.e., unwanted nationalities to be removed), and directly attached to the Reich as a district called Gotenland ("Land of the Goths") the renaming of cities such as Simferopol to "Gotenburg" and Sevastopol to "Theodorichshafen" (after the ancient Gothic King Theodoric the Great) and an adjustment to the border with Romanian-controlled Transnistria to remove overlooking of the shipyards at Mykolaiv. Nazi propaganda poster in Ukrainian that says "Hitler, the Liberator!". Hitler decreed the creation of the Nazi Party organization Arbeitsbereich Osten der NSDAP for the new eastern occupied territories on April 1, 1942. This move had been bitterly resisted by both Rosenberg, who rightly feared that the transformation of the administration of the eastern territories from a state to a party bureaucracy would spell the effective end of his ministry (a state organ)'s authority, and Heinrich Himmler, who rightly feared that an arbeitsbereich's establishment would be accompanied by the commissars becoming RVKs (commissars for war) and thus enormously empowered at the expense of the SS, which had already been steadily losing ground since late September the previous year, when the commissariat government began establishing itself with local commissars asserting control over the police in their territories, hitherto controlled by the SS. Himmler and Rosenberg's rearguard resistance soon collapsed in the face of pressure from Martin Bormann in Berlin, and Koch and Lohse in the field. Rosenberg at least managed to be appointed Reichsleiter ("Reich leader") of the new arbeitsbereich. Rosenberg later attempted to take such political power into the political section of the ministry to keep all party issues in his control, and prohibited the creation of organizations and any political activity in the East without his express authorisation. Needless to say he was entirely disobeyed. Hoping that by joining forces they might regain some influence, Himmler and Rosenberg decided upon the appointment of Gottlob Berger, Himmler's power-political hatchet man and the SS's head of personnel, as Rosenberg's deputy, a move which in theory would give Rosenberg control over SS forces in the occupied Soviet territories under civil administration in return for his support for the SS in its power struggles. The partnership between Rosenberg and Himmler achieved nothing other than the exasperation of each other beyond endurance and Berger soon withdrew all cooperation. Koch and Lohse thereafter gradually reduced communication with Rosenberg, liaising with Hitler through Bormann and the party chancellery. Both also made a point of establishing strong SA organisations in their jurisdiction as a counterbalance to the SS. Given that many of the commissariat officials were active or reserve SA officers, the pre-existing grudge against the SS was resurrected by these measures and a poisoning of relations was guaranteed. As a last resort, the Höherer SS- und Polizeiführer (HSSPF) in Ukraine, Hans-Adolf Prutzmann, attempted to approach Koch directly only to be contemptuously abused and dismissed. 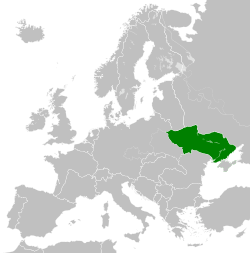 The Reichskommissariat Ukraine excluded several parts of present-day Ukraine, and included some territories outside of its modern borders. It extended in the west from the Volhynia region around Lutsk, to a line from Vinnytsia to Mykolaiv along the Southern Bug river in the south, to the areas surrounding Kiev, Poltava and Zaporizhia in the east. Conquered territories further to the east, including the rest of Ukraine (the Crimea, Chernihiv, Kharkiv, and the Donbas/Donets Basin), were under military governance until 1943–44. At its greatest extent, it included just under 340,000 square kilometers. Eastern Galicia was transferred to the control of the General Government following a Hitler decree, becoming its fifth district (Distrikt Galizien). 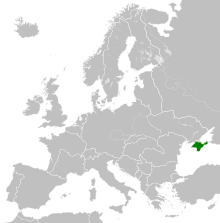 Former Soviet territory between the Southern Bug and Dniester rivers was also excluded from the Reichskommissariat Ukraine; this was given to Romania and named "Transnistria" or "Transniestra", governed from Odessa by Dr. Alexeanu, the Romanian Governor. It also encompassed several southern parts of Belarus, including Belarusian Polesia, a large area to the north of the Pripyat river with forests and marshes, as well as the city of Brest-Litovsk, and the towns of Pinsk and Mazyr. This was done by the Germans in order to secure a steady wood supply and efficient railroad and water transportation. The Staatssekretär 'Secretary of State' Herbert Backe was personally nominated by the Reich Minister for the Occupied Eastern Territories, Alfred Rosenberg. His ministry produced the "Instruktion für einen Reichskommissar in der Ukraine" for the direction of future administrators of the Reichskommissariat Ukraine. "Die Reichskommissare unterstehen dem Reichsminister für die besetzen Ostgebiete und erhalten ausschliesslich von ihm Weisungen..." ( translat. : The Reich's Commissioners are subordinated under the Reich's minister for the occupied eastern territories and receive only orders from him) was the "Führer" decree for the administration of the new eastern territories, the Reichskommissars reported to the Eastern Affairs Ministry. The capital of this German administration was in Rivne in Western Ukraine. The German Administration gave the role of "Chief of Ukrainian Principal Commission" to Professor Wolodomyr Kubijowytsch, an early local supporter. The civil and criminal justice local administration, apart from the local SS and Wehrmacht military justice branches, was staffed by "Parteien Chef", "Bailiffs", "Mayors", with supervision of German "Schoffen" (Advisers) and "Schlichten" (Arbiters) with ample legal powers. The most important cases or situations which affected "natural rights" of any "Aryan" subject, were managed in Rivne or Berlin. The Wehrmacht introduced reforms in Ukraine allowing limited religious liberty. In January 1942, Bishop Polikarp Sikorsky of the Ukrainian Autocephalous Orthodox Church became the temporary administrator of church lands in the German-occupied Ukraine and he was granted the title of Archbishop of Lutsk and Kovel. He also had authority over Bishoprics at Kiev, Zhytomyr (Bishop Hryhorij Ohijchuk), Poltava, Kirovohrad, Lubny (Bishop Sylvester Hayevsky), Dnipropetrovsk and Bila Tserkva (Bishop Manuyil Tarnavsky) by decree of the Civil German Administration of limited religious liberty in Ukraine. The German Administration also allowed Archbishop Alexander of Pinsk and Polesia to maintain the religious authority he wielded before the war and the same permission was granted to Archbishop Alexander of Volhynia. General District of Crimea in 1942. The Reichskommissariat's administrative capital was at Rowno (Rivne), and it was divided into six Generalbezirke (general districts), called Generalkommissariate (general commissariats) in the pre-Barbarossa planning. This administrative structure was in turn subdivided into 114 Kreisgebiete, and further into 443 Parteien. Each "Generalbezirk" was administered by a "Generalkommissar"; each Kreisgebiete "circular [i.e., district] area" was led by a "Gebietskommissar" and each Partei "party" was governed by a Ukrainian or German "Parteien Chef" (Party Chief). At the level below were German or Ukrainian "Akademiker" ("Academics"—i.e., District Chiefs) (similar to Polish "Wojts" in the General Government). At the same time at a smaller scale, the local Municipalities were administered by native "Bailiffs" and "Mayors", accompanied by respective German political advisers if needed. In the most important areas, or where a German Army detachment remained, the local administration was always led by a German; in less significant areas local personnel was in charge. Krim-Taurien (Crimea-Taurida; Melitopol) – headed by Gauleiter Alfred Frauenfeld (note that this district's title was a misnomer, it only included the area north of the Crimean peninsula up to the Dnepr river). Only the first of these saw transfer to civil administration in September 1942, with the peninsula remaining under military control for the duration of the war. Its administrator, Frauenfeld, played off the military and civil authorities against each other and gained the freedom to run the territory as he saw fit. He thereby enjoyed complete autonomy, verging on independence, from Koch's authority. Frauenfeld's administration was much more moderate than Koch's and consequentially more economically successful. Koch was greatly angered by Fraunfeld's insubordination (a comparable situation also existed in the administrative relationship between the Estonian general commissariat and Reichskommissariat Ostland). Scheduled for incorporation into the Reichskommissariat Ukraine but never transferred to civil administration were the Generalkommissariate Tschernigow (Chernigov), Charkow (Kharkiv), Stalino (Donetsk), Woronezh (Voronezh), Rostow (Rostov), Stalingrad, and Saratow (Saratov), which would have brought the boundary of the province to the western border of Kazakhstan. In addition, Reichskommissar Koch had wishes of further extending his Reichskommissariat to Ciscaucasia. The official German press, in 1941, reported the Ukrainian urban and rural populations as 19 millions each. During the commissariat's existence the Germans only undertook one official census, for January 1, 1943, documenting a population of 16,910,008 people. The 1926 Soviet official census recorded the urban population as 5,373,553 and the rural population as 23,669,381 - a total of 29,042,934. In 1939 a new census reported the Ukrainian urban population as 11,195,620 and rural population as 19,764,601; a total of 30,960,221. The Ukrainian Soviets counted 17% of total Soviet population. The Wehrmacht was pressured for political reasons to gradually restore private properties in zones under military control and accept the local volunteer recruits into their units and the Waffen-SS, promoted by local nationalists organizations OUN-B and OUN-M, whilst receiving political support from the Wehrmacht. The Reichsführer-SS and chief of German Police, Heinrich Himmler initially had direct authority over any SS formations in Ukraine to order "Security Operations", but soon lost it. Especially after the summer of 1942 when he tried to regain control over policing in Ukraine by gaining authority for the collection of the harvest and failed miserably, in large part because Koch withheld cooperation. Ironically, in Ukraine, Himmler soon became the voice of relative moderation, hoping that an improvement in the Ukrainians' living conditions would encourage greater numbers of them to join the Waffen-SS's foreign divisions. Koch, properly nicknamed "hangman of Ukraine," was contemptuous of Himmler's efforts. In this he was supported by Hitler who was sceptical when he was not hostile to the idea of recruiting Slavs in general and Soviet nationals in particular to the Wehrmacht. In the civil administration of the Reich Ministry for the Occupied Eastern Territories numerous technical staff worked under Georg Leibbrandt, former chief of the east section of the foreign political office in the Nazi Party, now chief of the political section in the Ministry for the Occupied Eastern Territories. Leibbrandt's deputy, Otto Bräutigam, had previously worked as a consul with experience in the Soviet Union. Economic affairs remained under the direct management of Hermann Göring (the Plenipotentiary of Germany's Four Year Plan). From 21 March 1942 Fritz Sauckel had the role of "General Plenipotentiary for Labour Deployment" (Generalbevollmächtigter für den Arbeitseinsatz), charged with recruiting manpower for Germany throughout Europe, though in Ukraine Koch insisted that Sauckel confine himself to setting requirements, leaving the actual "recruitment" of Ost-Arbeiter to Koch and his brutes. The Todt Organization Ost Branch operated from Kiev. Other members of the German administration in Ukraine included Generalkommissar Leyser and Gebietkommissar Steudel. The position of the Eastern Affairs Ministry was weak because its department chiefs: (Economy, Work, Foods & Crops and Forest & Woods) held similar posts in other government departments (The Four-Year Plan, Eastern Economic Office, Foods and Farming Ministry, etc.) with other supplementary junior staff. Thus the East Ministry was managed by personal criteria and particular interests over official orders. Additionally, they failed to maintain the "Political Section" at an equal level with more specialized departments (Economy, Works, Farms, etc.) because political considerations clashed with exploitation plans in the territory. Banknotes denominated in karbovanets (karbowanez in German). The karbovanets replaced the Soviet ruble at par and was in circulation between 1942 and 1945. It was pegged to the Reichsmark at a rate of 10 karbovantsiv = 1 Reichsmark. In accord with information composed by Lutz von Krosigk, the Reich Minister of Finances. The Reich Ministry for the Occupied Eastern Territories ordered Koch and Hinrich Lohse (the Reichskommissar of Ostland) in March 1942 to supply 380,000 farm workers and 247,000 industrial workers for German work needs. Later Koch was mentioned during the new year message of 1943, how he "recruited" 710,000 workers in Ukraine. This and subsequent "worker registration" drives in Ukraine would eventually backfire after the Battle of Kursk (July–August 1943) when the Germans would attempt to build a defensive line along the Dnieper only to discover that the necessary manpower had been either recruited to forced labour in Germany or had gone underground to forestall such "recruitment". Alfred Rosenberg implemented an "Agrarian New Order" in Ukraine, ordering the confiscation of Soviet state properties to establish German state properties. Additionally the replacement of Russian Kolkhozes and Sovkhozes, by their own "Gemeindwirtschaften" (German Communal Farms), the installation of state enterprise "Landbewirstschaftungsgessellschaft Ukraine M.b.H." for managing the new German state farms and cooperatives, and the foundation of numerous "Kombines" (Great German exploitation Monopolies) with government or private capital in the territory, to exploit the resources and Donbass area. Hitler said "Ukraine and the East lands would produce 7 Million, or more likely 10 or 12 Million of Metric tonnes of Grain to provide Germany's food needs". The regime was planning to encourage the settlement of German and other "Germanic" farmers in the region after the war, along with the empowerment of some ethnic Germans in the territory. Ukraine was the supposed residence of ancient Germanic Gothic tribes. The sending of Dutch settlers was charged to the "Nederlandsche Oost-Compagnie", a Dutch-German Company dedicated to encourage the colonization of the east by Dutch citizens. The German civil administration met "Volksdeutsche" (ethnic Germans) in Mykolaiv, Zaporizhia and Dnipropetrovsk. The archives of the Soviet census in 1926 counted them as 393,924 persons. The Soviets counted ethnic Germans in all Russia at 1,423,534, or 1% of the total population in 1939.
encouraged recruitment to the German Army or service in the civil administration in the territory, amongst other special measures. In Ukraine the Germans published a "local" journal in the German language, the Deutsche Ukrainezeitung. During the occupation a very small number of cities and their accompanying districts maintained German names. These cities were designated as urban strongholds for Volksdeutsche natives. Hegewald (Himmler's field headquarters and the location of a small, experimental German colony), Försterstadt (also a Volksdeutsche colony), Halbstadt (a German Mennonite settlement), Alexanderstadt, Kronau and Friesendorf were some of these. On 12 August 1941 Hitler ordered the complete destruction of the Ukrainian capital of Kiev by the use of incendiary bombs and gunfire. Because the German military lacked sufficient material for this operation it wasn't carried out, after which the Nazi planners instead decided to starve the city's inhabitants. Heinrich Himmler on the other hand considered Kiev to be "an ancient German city" because of the Magdeburg city rights that it had acquired centuries prior, and often referred to it as "Kiroffo". ↑ "Nazi Conspiracy and Aggression". Decree of the Fuehrer concerning the administration of the newly-occupied Eastern territories. The Avalon Project at Yale Law School. 1996–2007. Retrieved 2007-10-04. 1 2 The Rise and Fall of the Third Reich. William Shirer. p. 939. ISBN 978-1-4516-5168-3. ↑ "Nazi Conspiracy and Aggression". About Discussions [of Rosenberg] with the Fuehrer on 14 December 1941. The Avalon Project at Yale Law School. 1996–2007. Retrieved 2007-10-04. 1 2 Berkhoff, Karel C. (2004). Harvest of despair: life and death in Ukraine under Nazi rule, p. 37.. President and Fellows of Harvard College. 1 2 Berkhoff, p. 39. ↑ Dallin, Alexander (1958). Deutschen Herrschaft in Russland 1941–1945, p. 67 (in German). Droste. ↑ Музичук С. країнські військові нарукавні емблеми під час Другої світової війни 1939-45 рр. // Знак, 2004. — ч. 33. — с. 9 – 11. 1 2 3 Lower, p. 267. ↑ Lower, Wendy: Nazi empire-building and the Holocaust in Ukraine, pp. 162-181. University of North Carolina Press, 2005. ↑ Lower 2005, p. 197. ↑ Jehke, Rolf: Territoriale Veränderungen in Deutschland und deutsch verwalteten Gebieten 1874 - 1945. 23 February 2010. (In German). Retrieved 10 August 2010. ↑ Rolf Jehke. "Generalbezirk Dnjepropetrowsk". Territorial.de. Retrieved 2014-06-03. 1 2 Berkhoff, pp. 164-165. Toynbee, Arnold; Toynbee, Veronica; et al. (1954), "Ukraine, under German Occupation, 1941-44", Hitler's Europe, London: Oxford University Press, pp. 316–337 . Berkhoff, Karel C. (2004), Harvest of Despair: Life and Death in Ukraine Under Nazi Rule, Cambridge, Mass. : Belknap Press, ISBN 0-674-01313-1 . Rich, Norman (1974), Hitler's War Aims: The Establishment of the New Order, New York: W. W. Norton & Company, ISBN 0-393-05509-4 .